General admission; get there early for a good seat! Nicola Daley (role now played by Naomi Livingstone), Ramesh Meyyappan, and Chris Alexander in Butterfly. BOTTOM LINE: Butterfly is a sensory delight that grips at your heart without uttering a word. Butterfly’s title character is a kite-maker (played by Naomi Livingstone) living a simple, joyful life alone, with only her kites, her dreams, and a Customer who dotes on her (Chris Alexander) for company. One day, she encounters a butterfly catcher named Nabokov (Ramesh Meyyappan) who appears to share her love of butterflies and flight. The two quickly fall in love and cohabitate, even though they have different ideas of how they want to celebrate butterflies’ beauty. Nabokov learns of the Customer, who courts without Butterfly’s affection in return, but the two men still become jealous and blame Butterfly. Eventually a tragic event occurs that compels Nabokov to leave Butterfly, alone once again, but isolated and broken so she cannot go about her life as before. I latched onto the “Madame Butterfly adaptation” aspect of Butterfly’s marketing materials, but then I was surprised that the piece didn’t look more like the Puccini opera, or David Henry Hwang’s M. Butterfly, or Miss Saigon. While Butterfly does have many of the well-known plot points of its source material, this piece does not grapple with East Asian/American relations and racism like its predecessors. Yes, the Butterfly character is still engaged in an interracial romance (with a man who happens to be played by a Scotland-based Singaporean). Still, her ultimate abandonment is not the result of her race, but rather her powerlessness against the will of two jealous, possessive men. Furthermore, the piece’s ambiguous pastoral location removes it from the highly political and exoticized locales where Butterfly’s story has previously been set (namely Japan, China, and Vietnam). This adaptation makes Butterfly’s story more of a generic feminist critique than an exposé of racial exoticism (an important structural distinction to note when considering the choice to cast Butterfly as a white actress). While Asian storytelling wasn’t given the spotlight here, another underrepresented group in the theater scene had a chance to celebrate: the deaf/hard-of-hearing community. Though Butterfly’s marketing doesn’t specifically label the play as “for deaf audiences” (a wise move to attract a diverse crowd and help contextualize non-verbal theater as part of the mainstream), clearly those who are in the know about Meyyappan’s work geared towards the deaf audiences are excited about it. A relatively large group of signers flocked to see Meyyappan’s physical/visual theater the night I attended. It’s exciting and refreshing to see such expert theater that eliminates language as a barrier. Politics aside, Butterfly effortlessly swept the audience away in a sensory adventure. Music composed by David Paul Jones accompanies this fairytale-esque world with a delicate, elegant soundscape of piano, strings, and synth. The movement, choreographed by Darren Brownlie, is clean and clear, with a crisp specificity in its symbolism and a few hints at familiar sign language imagery. Neil Warmington’s minimalistic set—made primarily with bamboo sticks and wood furniture—keeps the world specific and simple in the small space, yet still full of surprises. This setup allows Jones’ aforementioned music and Kate Bonney’s lighting to shine, regarding both tone and jumping between indoor and outdoor, real and imagined locations. And of course, Gavin Glover’s puppets steal the show. Between the audience’s collective astonishment over how the performers operate the puppets, and the characters’ keen interest in how Butterfly’s kites are built, the play seems to celebrate the marvel of how things are made, and how inanimate objects are given life. Butterfly is a lush, one-hour sensory explosion that engages us in the impact of visual theater through a tragic tale. Butterfly is created and directed by Ramesh Meyyappan, based on Madame Butterfly by John Luther Long. Assistant Director is Ross Mackay. Scenic and Costume Design is by Neil Warmington. Lighting Design is by Kate Bonney. 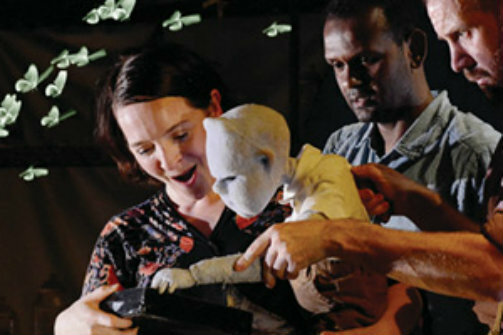 Puppet Director and Maker is Gavin Glover. Original Music by David Paul Jones. Choreographer is Darren Brownlie. Dramaturg is George Aza-Selinger. Production Manager is Simon Gane. Production Stage Manager is Carrie Taylor. Stage Manager is Cressa Amundsen. The cast is Ramesh Meyyappan, Naomi Livingstone, and Chris Alexander.